With high-profile events scheduled all year long, it's always play time in Abingdon. Visitors and locals alike are drawn to Abingdon's signature events. Stroll through downtown Abingdon at one of the summer street festivals; catch nationally known music acts at Barter Theatre and the Market Pavilion; or beat your personal best at one of our signature races. This series of concerts on the Barter Theatre stage showcases nationally recognized artists. 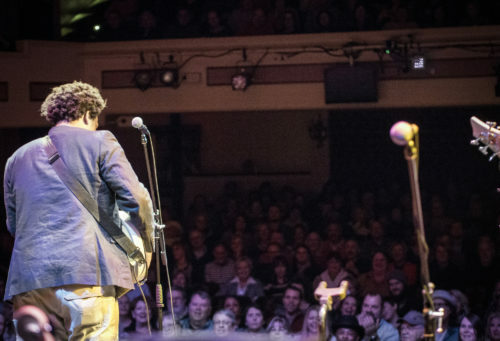 On Fridays and Saturdays in January, Abingdon Music Experience presents a uniquely intimate concert experience with legendary musicians at the historic Barter Theatre. Since its inception in 2011, January Jams has featured artists like the Dirty Dozen Brass Band, the Blind Boys of Alabama, Ricky Scaggs, Mavis Staples, and Jason Isbell, to name a few. Barter Theatre is traditionally "dark" in January, so it's the perfect venue for a winter concert series. January Jams puts Grammy-Award winning artists on stage each weekend of the month. An intimate venue with just 500 seats, Barter offers a unique experience with these musicians that cannot be replicated anywhere else. New play readings and staged "mini-production" in mid-January. With its unusual roots in Depression-era Appalachia (when hungry actors traded "Ham for Hamlet," Barter Theatre has always been a uniquely Appalachian institution. The professional Equity theatre celebrates all things Appalachian with its annual festival of plays and playwrights. Watch new plays being developed before your eyes, with a series of professional readings and a "mini-production", followed by talkbacks with the playwrights. A wide variety of national acts perform at Barter Theatre during January Jams. St. Patrick's Day Weekend. 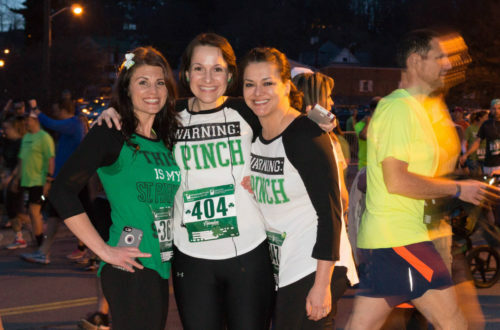 Make sure to wear your lucky green for this popular nightrace and St. Patrick's Day celebration.The 4-mile race follows a course through downtown Abingdon, beginning and ending at the Market Pavilion on Remsburg Drive. For those who would prefer an easier course, the 1.3-mile Leprechaun Walk begins at the same time. Learn more about the Shamrock 4-Miler. Celebrate the award-winning Virginia Creeper Trail by checking out the multitude of outdoor recreation opportunities enjoyed along the trail by nature lovers of all ages. Get hands-on with kids' field day activities, yoga in the park, Tree identification along the trail, scheduled bike rides, geocaching, Disc dog exhibitions and clinics, hammock hangouts, equipment demos, outfitters, food Trucks and live music throughout the day. Runners celebrate after finishing the Shamrock 4-Miler in downtown Abingdon, VA. 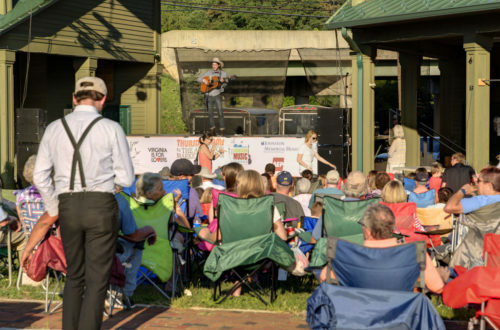 Crowds enjoy free outdoor concerts in downtown Abingdon with Thursday Jams each summer. Downtown Abingdon's Market Pavilion is booked with free outdoor concerts every Thursday night from May to July. The lawn is filled with lawn chairs and picnic blankets, while dancers claim the space in front of the stage. Abingdon's Main Street organization runs a beer garden where you can find local craft beers on tap. On stage you'll find up-and-coming acts like Honey Honey or Liz Vice as well as roots and Americana stars like Langhorne Slim or the Wood Brothers. For 10 days every August, Abingdon is completely transformed, playing host to one of the biggest and best arts festivals in the southeast. The celebration extends beyond the downtown street festival, though, with opportunities to play outdoors in nature, attend classes and workshops, and time travel to Abingdon's colonial past with living historians. 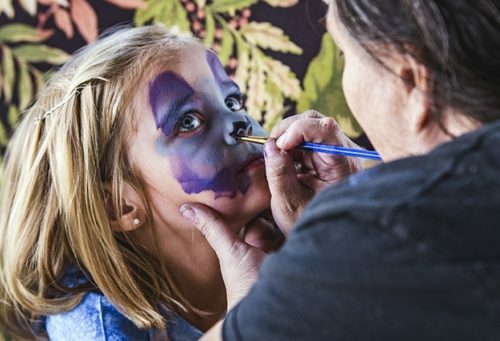 Kids enjoy free activities like face painting at Main Street Busker Fest. 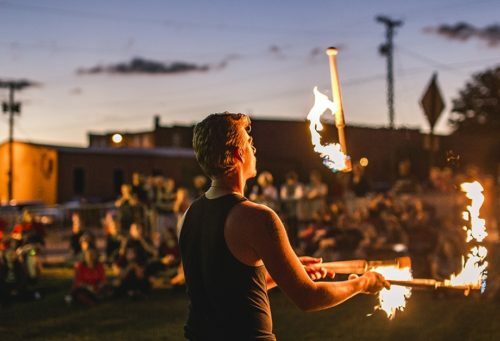 On the Saturday of Labor Day weekend, the sidewalks of downtown Abingdon are filled with weird and wonderful performing artists during Busker Fest. The Abingdon Main Street organization presents this family-friendly festival, including the Imagination Station, where kids can make crafts and practice their own busking skills. At Buskers After Dark, those 21 and up can mix and mingle with best of the buskers. Celebrate the most totally rad decade with this free street party. Abingdon shuts down Main Street for live music, a costume contest, 80s photo booth, food trucks and street fair.